Style F Bobbins - Limited selection. Style F bobbins are 0.303 inches (0.986 centimeters) high and 0.770 inches (2.504 centimeters) in diameter. 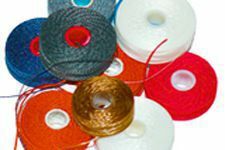 The Bobbin Buying Guide gives information needed to buy the right prewound bobbins. Print templates for Styles A / 15, G, L, M, and U with precise U.S. and metric dimensions for visual matching.